News partners across the region include 7News Australia (@7NewsSydney), 9News Australia (@9NewsAus), ABC News (@ABC), ABC News Australia (@ABCNews), Arirang TV (@ArirangTV), Bloomberg (@BloombergAsia and @tictoc), Fuji TV (@houdoukyoku), NBC News (@NBCNews), SBS (@SBS8News) and TBS (@tbs_news). To get analysis and insights on the #TrumpKimSummit, make sure to follow and watch the Blue Rooms on Twitter hosted by Arirang TV (@arirangworld) and Bloomberg (@tictoc) on June 11th and 12th. Arirang TV, supported by the Korea Press Foundation, will be holding a special "Korea Peace Talk" Twitter Blue Room, a live 120-min session starting at 3:00pm SGT on Mon, June 11th. To be broadcast from the Korean press center at the Swissotel The Stamford hotel in Singapore, the Blue Room will be moderated by Anna Fifield (@annafifield), Washington Post's Tokyo-Seoul bureau chief, and she will be joined by a panel of Korean political experts: Kim Joonhyung, a professor at Handong Global University of Korea; Kim Jiyoon, a research fellow at the Asian Institute for Policy Studies; John Delury (@JohnDelury), an associate professor from Yonsei University, and Shawn Ho, an associate research fellow from Nanyang Technological University. Follow @arirangworld to watch Arirang TV's Blue Room on Twitter. Bloomberg will be hosting a special TicToc Blue Room, a live 30-minute session starting at 10:30am SGT on Tue, June 12th. Taking place on the rooftop of the iconic Fullerton Hotel in Singapore, the Blue Room will be hosted by Yvonne Man (@YvonneManTV), Bloomberg's anchor for DayBreak Asia, and her panel will be Bloomberg's White House Correspondent Kevin Cerilli (@kevcirilli) and Bloomberg's Korea reporter Jihye Lee (@TheJihyeLee). As it is the first time TicToc will be broadcasting live from Twitter's Blue Room, the show will leverage the speed and conversation on Twitter to bring expert analysis and insights. Follow @tictoc to see Bloomberg's Blue Room and submit questions with the #TalkTrumpKim hashtag. Twitter has launched a #TrumpKimSummit emoji to recognise this important moment. The design of the emoji shows two hands touching palm-to-palm, with one hand in the USA colours and the other hand in the North Korea colours. 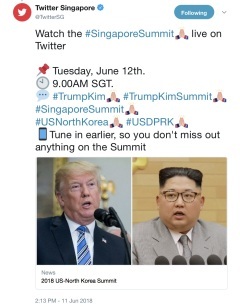 Get your front row seat to this important event by following and participating in the #TrumpKimSummit conversation on Twitter today!